Most people invest the majority of their lifetime trudging down the intertwined paths of experience and inspiration, in search of that one thing they are destined to do. 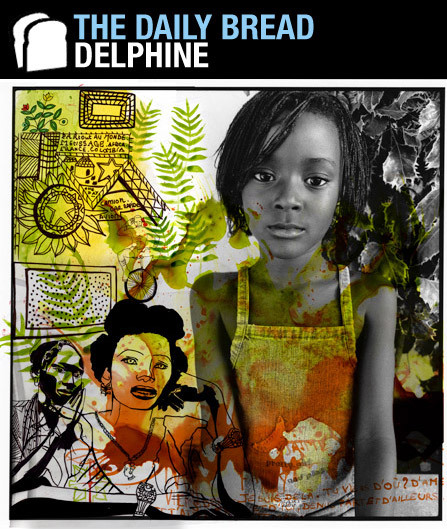 Delphine Diallo, equipped with her multifaceted artistic talents, has accomplished more in the past 7 years than most will ever ponder. Her French-Senegalese bloodline and Paris upbringing positioned her in the perfect arrangement for her creative abilities to flourish. The freelance art director, photographer, animator, painter, and graphic designer, currently residing in New York City, mashes her groundbreaking visions with her passions. With her developed technique of painting over her photography to further express what she feels at the moment, is captured in each image. With her hard work and dedication to her craft, Diallo has gained the respect of major record companies such as Virgin, Barclay, Universal, and Sony. Her resumÃ© is quite impressive and with such a vivid imagination and list of influential supporters, Delphine Diallo is destined for longevity. Format: At what moment in life did you discover that art was what you wanted to dedicate your existence to? Delphine Diallo: Well, I cannot give you an exact date. I just know that it was written already. Format: Do all of your influences stem from the realm of art, or do other forms of creativity impact your presentation? Delphine Diallo: Not at all. This is exactly what I donâ€™t have to do when Iâ€™m in the process to work on a new piece- take influence from the art world. I have a lot of respect for a lot of artists such as Picasso, Dali, and many others, but I just believe that if you are trying to make something different, you should be more influenced by what is going on right now (in your time) and it can be your own city, your street or the way that you see the world in 2008. Your art can be something very personal but at the same time universal. Format: With those inspirations, do you capture natural moments or do you set up your shots? Delphine Diallo: Well, set up is good but it has to do with natural moments too. One of each works pretty well. Format: You have such a unique background and quite a collection of passport stamps. Which place nurtures your creative ability the most? 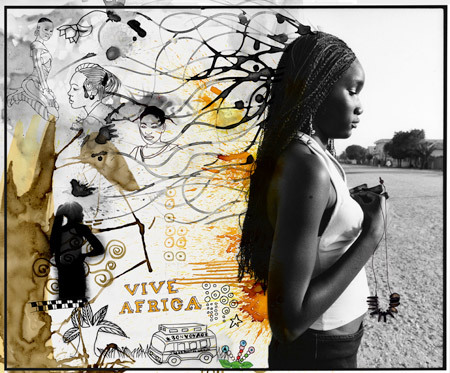 Delphine Diallo: Africa. Africa is the first place that I felt I was 100% myself. Africa is where my roots are (Senegal, Saint-Louis). Over there, no one is running and people take time to share and stay in family. Iâ€™m inspired because of the nature, light, people, colors, wildlifeâ€¦everything about Africa is inspiring. Format: Through research, we discovered you use your artwork as a medium to give your personal point of view. What do you want to illustrate in your art? Delphine Diallo: Well, just simple things. We are all, already mixed up and make up a part of this crazy world. Superficiality, globalization, and individuality represent our new generation. Iâ€™m just trying to find the way to go through a world filled with different questions when sometimes I still donâ€™t have the answers. Format: Where did you get the idea of painting and drawing over your photography? 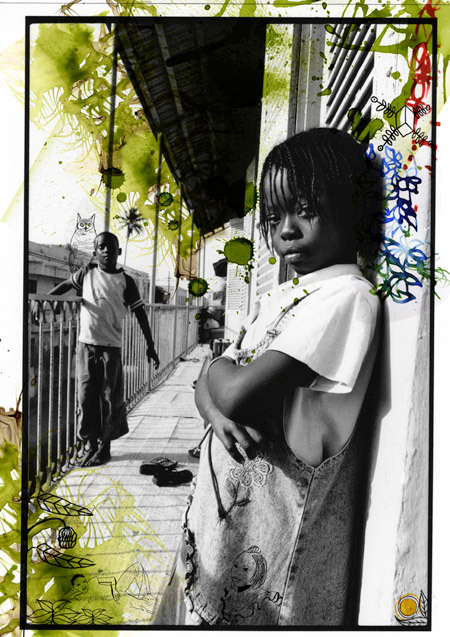 Delphine Diallo: Peter Beard. I donâ€™t think he would give up all his secrets, but heâ€™s probably the most creative person than Iâ€™ve ever met, up until to this point in my career. He never stops. Heâ€™s working on clip-in photography and writing in his diaries, when heâ€™s not painting on his amazing photography with blood, ink, collage, and other things. He is a very open minded person and lived in Kenya for more than 40 years. In the early 60s he worked at Kenyaâ€™s Tsavo National Park, during the time in which he photographed and documented the demise of over 35,000 elephants and 50,00 Black Rhinos and published two The End of the Game books (1965 & 1977). During this same time period, he acquired Hog Ranch, the property adjacent to Karen Blixenâ€™s near the Ngong Hills and made it his home base in East Africa. Beard has written further works on his African experience: Eyelids of the Morning: The Mingeled Destines of Crocodiles and Men (1973), Longing for Darkness (1975), and his most recent books Zaraâ€™s Tales: Perilous Escapades in Equatorial Africa (2004) written for his daughter and Peter Beard, published by Taschen in November 2006. Format: I noticed most of your work captures serene people in their natural environment. Is there any meaning or reasoning behind these choices of setting and tone? Delphine Diallo: Yes, pureness of the beauty at the moment. A natural moment is unique, like a magic chemical instant. Format: Your pictures capture raw and natural emotion. Do you think that it involves any level of romance? Delphine Diallo: I would say spirituality and lots of love. Format: If you were not an artist what would you be doing? Delphine Diallo: Hmmm, working hard. Well not just with art unfortunately, life would be too easy and maybe less inspiring. Iâ€™ve also worked as art director, video editor and photographer in many production companies for about 8 years. Most of the production companies are working for music, fashion, film industries. So, I can use all those skills to work and be connected with creative people. Itâ€™s great a combination. Itâ€™s nice to not feel alone and disconnected from the creative world. Format: What is a typical â€œoff dayâ€ like? Format: Which five artists are you listening to the most in your iPod? Format: Cool. Is any of your art for sale? If so, where can it be purchased or viewed? If not, why do you choose not to make it available for purchase? 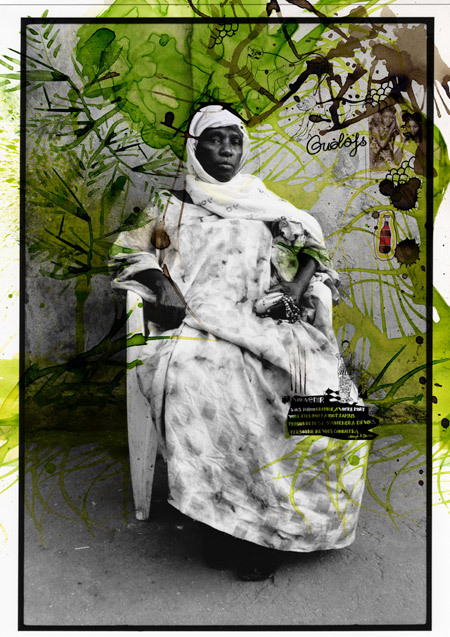 Delphine Diallo: I already sold most of my pictures in Africa, but people can ask me for any prints. Itâ€™s best to contact me on my email: diawparis@yahoo.fr. Format: What impact do you want to make on society via art? Delphine Diallo: I do not express my art to a mass culture. I just try to touch the sensitivity of someone who likes my artwork. Format: If you could capture one person in recent history, who would it be and how would you display him or her? Delphine Diallo: I take photographs of Peter Beard on his living room working on his diary. However, I do not display Peter beard in my work. Iâ€™ve been working with him and heâ€™s my mentor. He is the best fit for me; because he already understood why Africa was so inspiringâ€¦the truth is in the amazing Africa, whether it is good or bad. Format: Whatâ€™s next for Delphine Diallo? 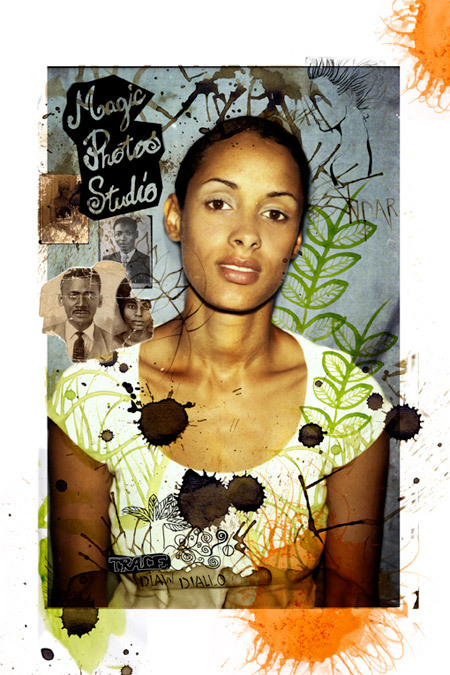 Delphine Diallo: Being more and more creative. Itâ€™s an obsession. My latest work Magic Photo Studio will be displayed at La FIAC in Paris in October and Iâ€™m actually working on new projects, but it s still too early to tell you what itâ€™s about. For more information, visit Delphine Dialloâ€™s website. Never really heard of Delphine until this article, but just from doing a little research I find it very intriguing! Great article, great questions! You dug deep, and I feel like i understand someone i just met for the first time!